So it is Good Friday. 2013. That is three years after 2010. For those who count in threes. Work wise, Melbourne International Comedy Festival had begun and therefore its a little busy. So I am just at home writing while my phone constantly receives email and calls. And the shops are closed, everyone seems to forget this every year, so when you are actually craving a hot cross bun or chocolate, there is none anywhere. Not even the ones you baked a few days ago. I start my new role in a month, event managing a theatre. Once again, another cool chapter to come I reckon. I shall write about it. Seems like the thing to do. I went across and bought a coffee the other day. From a shop in Melbourne, a coffee shop at that. I stood there with the server who asked me what I was up to. I said, “work”. He said “cool”. Comedy Festival was mentioned and the barista’s ears pricked up. He said someone mistook him for Peter Helliar once. He is a not-so – funny comedian in Australia. I didnt really have much to say to that, and the barista then volunteered the fact he was a stand up comedian once upon a time in Perth. I looked impressed, got my coffee and then left the shop, the coffee shop. 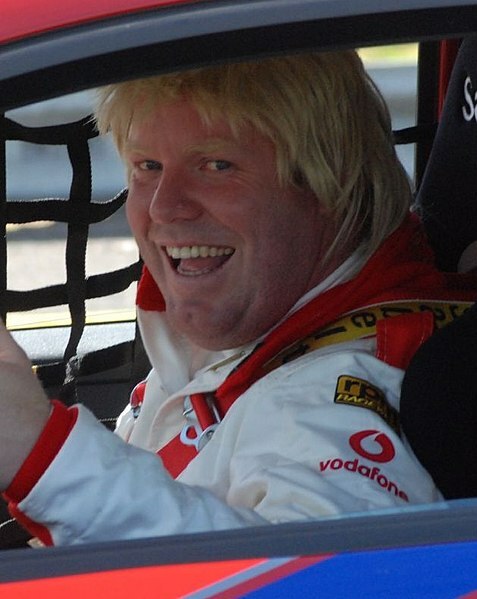 PS this is Peter Helliar. I also want to take this opportunity to advise people, it is three years until 2016. Especially for those that count in threes. 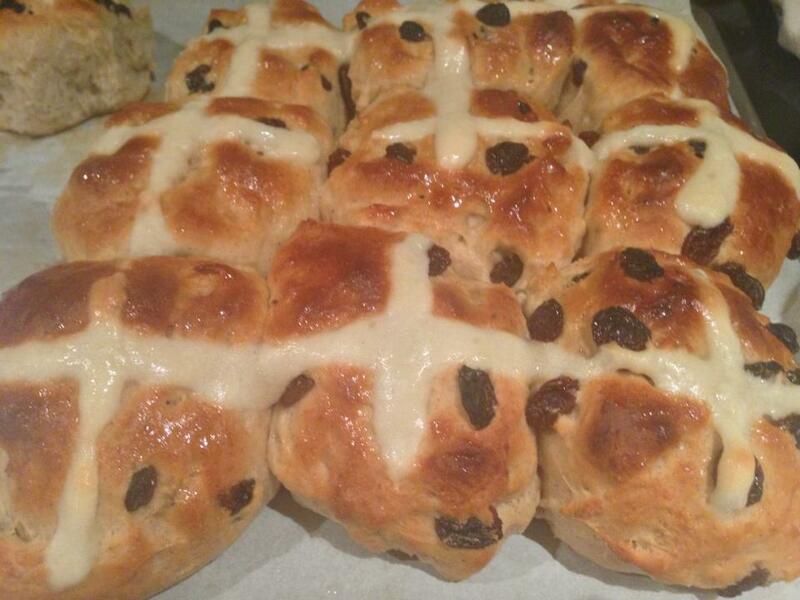 Buns that are Hot with the Cross on them. So it’s Easter. So you really should make these, as they taste good. And if you are one of those people who complains about dried fruit, just don’t put them in or tell people that you don’t like dried fruit. I made these yesterday, from my own recipe after searching high and low for a good one. Thanks to tips from baker Dan Lepard and others I came up with this. After I made them, I am pretty sure it felt like Easter officially and rabbits appeared from all directions to agree with me. 2 tablespoons finely chopped mixed peel (If you like, or not). 1. Combine the yeast with one tablespoon of the sugar and all of the apple/water solution in a small bowl; whisk until the yeast is dissolved. Cover the bowl and stand in a warm place (on the door in front of a very slow oven is ideal) for about 10 minutes or until the mixture is frothy. Just be careful as I came back and mine was overflowing with froth. Put a saucer under it and enjoy the cider-like smell. 2. Sift the flour, spices and salt into a large bowl; rub in the butter. Stir in the remaining sugar, fruit, yeast mixture, egg and enough water to make a soft sticky dough. Cover the bowl with oiled plastic wrap and stand in a warm place for about one hour or until mixture is 1.5 times the size. DONT do the typical old rule of double in size. 3. Preheat the oven to 220°C (200°C fan-forced). Turn the dough onto a lightly oiled surface (lightly floured adds more flour to the mixture and dries it out) and knead for about 1 minute (to avoid punching out all the air). Divide the dough into 20 portions; quickly form each portion into a ball and roll the dough into a ball. Place the balls, almost touching, on a large greased oven tray. Stand in a warm place for about 20 minutes or until dough is almost 1.5 times in size. 4. FLOUR PASTE: Sift flour and sugar into a small bowl; gradually stir in enough water to make a smooth thick paste. Place the Flour Paste into a resealable plastic bag and snip a tiny piece off one corner. Pipe crosses onto the buns. 5. Bake the buns for about 15 minutes or until buns sound hollow when tapped. Though need to make sure the insides are cooked, so really listen out for the hollow-like sound. Otherwise you end up with dough and disappointment. 6. GLAZE: Meanwhile, combine all ingredients in a small pan and stir over low heat, without boiling, until the sugar is dissolved. 7. Transfer the buns to a wire rack and brush the tops with the Glaze once cooled a little. Dont put too much on that it makes the underneath of the bun soggy. Cooked buns are suitable to freeze (though I would just eat them all straight away). Glaze suitable to microwave (just in case you thought it had metal in it). Yes.. another Peter Gabriel video. And I only JUST discovered this song cause of Glee, so that is admitting another guilty pleasure. Or shall I just say it happened to be on when I flicked channels? Looks like it was from some film in the 80’s, that involved a lot of big overcoats and portable sound systems. Just a fun and simple song for a Sunday, as we begin to feel the colder mornings.